You’ve seen the Game of Thronesy images from Universal’s Snow White and the Huntsman — now look upon the infinitely more wacky Snow White production, from The Cell director Tarsem Singh. See the first ever cast photos for Snow White and the Huntsman! No real surprise here — Tarsem‘s brood of fairy tale creatures all look like they were plucked from the technocolored TV screens during the Wizard of Oz days. The blues are so blue! The orange is so bright! This is just classic Tarsem right here. That being said I hope the director left some room to sprinkle a little darkness into this tale. We’ve hear that there will be comedy and loads of magic in his version of Snow White, but we really hope he can tap into that dark madness from which he created The Cell. Armie Hammer as Prince Charming. 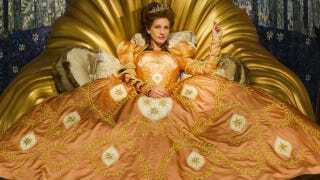 Julia Roberts as the Evil Queen.